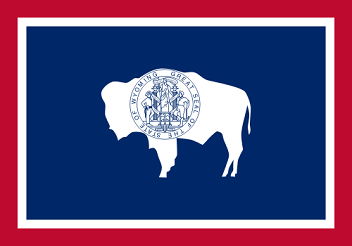 The red, white and blue border style State Flag of Wyoming depicts a central image of a bison with a depiction of the state seal. 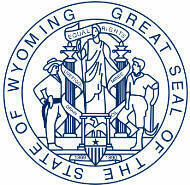 The seal features the Greek Goddess Nike, the spirit of victory and the male figures of a miner and a farmer representing the mining and farming industries in Wyoming. 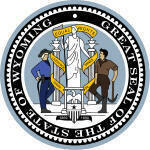 The Wyoming flag serves as a symbol of honor, heritage and regional pride and is displayed at state buildings. There is an Order of Precedence for flags. State Flags are displayed in order as they entered the Union. Car Flags are often displayed to represent of an individual's allegiance to their state. Wyoming State car flags are used by their owners as mobile emblems of their home. Car flags are usually made from strong materials and are attached to a car via a pole and clip window attachment. What is the design of the Wyoming state flag? What does the bison or buffalo on the flag symbolize? The image of the buffalo honors this magnificent animal that was so important to the early inhabitants of Wyoming. Between 1872-1883 the bison were slaughtered almost to the point of extinction and it is estimated that only 750 bison were left in the United States in 1884. The seal also echoes the custom of branding livestock in the agriculture industry. What does the image on the seal depicted on the flag symbolize? The image on the seal depicts the Greek Goddess Nike, the spirit of victory, holding a banner containing the Wyoming motto, bearing the words, "Equal Rights"
The pillars symbolize fortitude and constancy. The lamps that top the pillars burn the Light of Knowledge. What is the shape and Wyoming flag ratio? The 'Hoist' is the width and the 'Fly' is the length. Who designed the Wyoming State Flag? What is the history of the Wyoming State Flag? The Wyoming flag is kept and used as required by the code specified in the constitution of the state.